We spent the day with an organization called Samuha that works to improve the lives of vulnerable communities. Our train arrived early morning in Raichur, and we boarded vans for a bumpy ride into the countryside. The scenery no longer consisted of heavy traffic and five-story apartment buildings, but thatched huts, ox carts, hand pumps, and farm land. 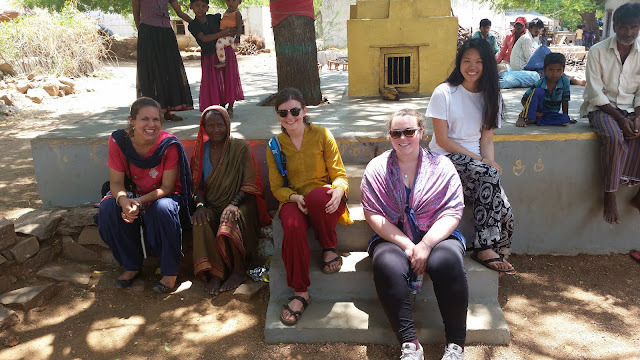 We were welcomed by our hosts, an organization called Samuha that works to improve the lives of vulnerable communities. We divided into four groups to visit villages in which Samuha is facilitating water conservation and climate neutral projects. We met with a group of villagers who were digging water pits step-wise down a hill. Not only can these water pits collect 9,000 liters of water for irrigation, but they also serve to prevent erosion of the dry soil, to collect fertile silt that can be used for farming, and to recharge the groundwater. Most importantly, many of the villagers earn their livelihood through this work. 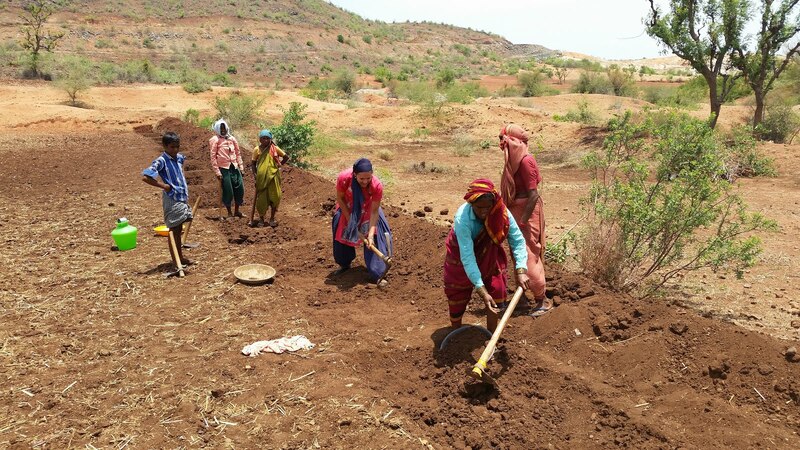 Under the Mahatma Gandhi National Rural Employment Guarantee Act, the government guarantees one hundred days of minimum wage employment per year to adults of rural households who volunteer to do unskilled manual labor. Samuha's role is to spread awareness about this act and to facilitate the interaction between the villagers and the government. This interaction involves an application process and a process of deciding which projects are most important for the village. We had the opportunity to join the villagers in digging the pits, and we quickly experienced the difficult nature of the work. After a mere half an hour with the pick ax, I was covered in sweat and blisters. I gained a new respect for the villagers, and I think they enjoyed watching some foreigners work side by side with them. They offered me some gutka (chewing tobacco) and water and told me I am one of them. It is beautiful to see how working together can bring people of different languages, religions, and cultures together.